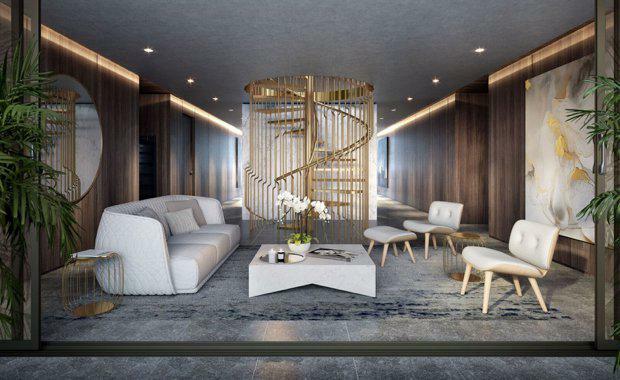 Melbourne developer Kokoda Property has today launched its latest residential offering in Brisbane's Newstead, Chester, on the corner of Chester and Ella Streets. Still at pre-sales stage, the new development offers one and two bedroom apartments ranging in size from 60 to 94 sqm, with prices ranging from $415,000 to $755,000. Executive options are priced through to $3 million. Chester features amber-crafted metallic finishes with bronze glazing. Ministry of Design Singapore, an award-winning international design firm, has crafted the lobby with a warm and modern entrance adorned with custom lighting, herringbone oak flooring and soaring ceilings. Each apartment features monochromatic palettes of bold matte-black with cool-white marble finishes and high ceilings. Full length doors slide open on to generous private balconies with Elba marble benchtops, designer under-mount black sinks, matte-black tapware and Miele appliances. Chester's rooftop facility features a swimming pool, spa, outdoor cinema, kitchen and barbecue areas, along with a putting green, outdoor terrace and "fire pit".